Ships tomorrow if you order in the next 18 hours 24 minutes. Vitamin B12 is a water-soluble vitamin that is important for metabolism. It helps with the maintenance of the nervous system and with the formation of red blood cells. B12 is found in many animal foods, but no plant foods (unless fortified); therefore, vegans and vegetarians should watch their levels. 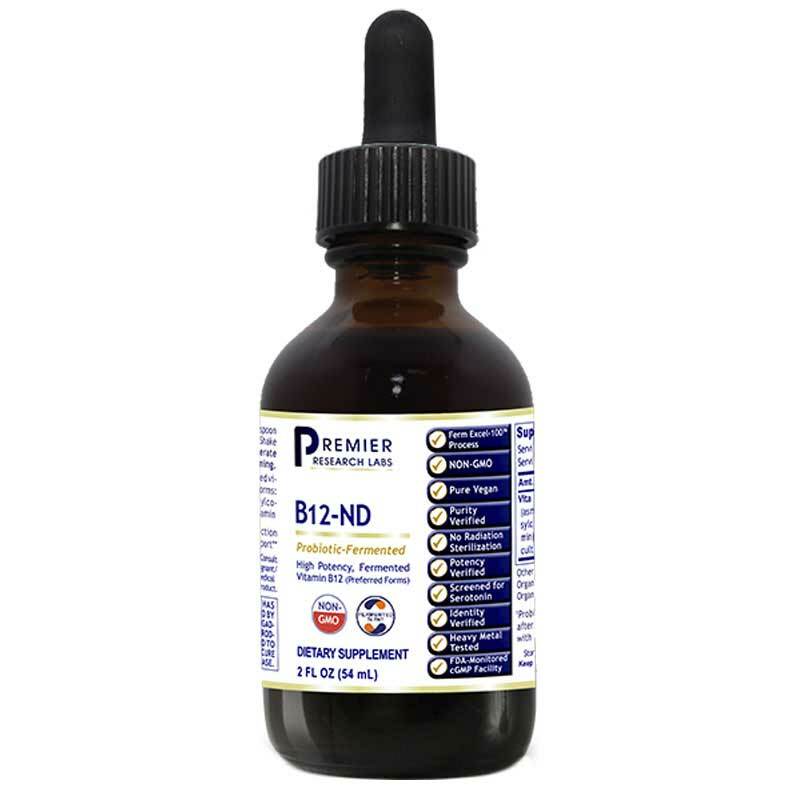 B12-ND by Premier Research Labs is a probiotic-fermented B12 supplement that supports nervous system health, as well as the formation of fatty acids, blood and nucleic acids. This supplement has undergone a proprietary fermentation process that uses unique multi-strain probiotic colonies. B12-ND is preserved with certified organic alcohol. It is 100% excipient free, 100% pure vegan and gluten free. If you need a vitamin B12 boost, give B12-ND a try. Order online today! Other Ingredients: purified water, organic alcohol, organic molasses, organic cane sugar. Vegan and Non-GMO. *Probiotic culture inactivated after fermentation; preserved with organic alcohol. Adults: Take 1/4 teaspoon mixed in 4 oz of water daily. Shake gently before use. Refrigerate after opening. This is especially good. It is a natural B12 with no artificial additives.